Seen below is the WonderCon footage reel that Warner Bros. showed off recently and as with all the footage we’ve seen so far from the film, it’s damn impressive. It shows off Pacific Rim‘s massive scale and scope as well as giving us a glimpse at more of the supporting characters. There’s honestly far too much “awesomeness” packed into this trailer and to try and describe it all would be futile. We advise you check it out for yourself below. Admittedly, a lot of what is seen here has already shown up in previous trailers but there’s still enough new footage here to get you excited for what will undoubtedly be one of the summer’s biggest releases. 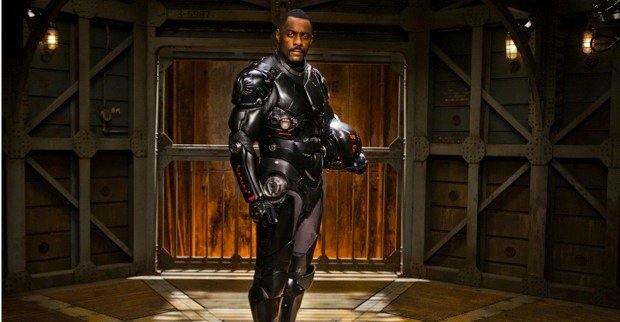 Idris Elba leads a fantastic cast that also consists of Charlie Day, Charlie Hunnam, Rinko Kikuchi and Ron Perlman. Pacific Rim storms into theatres on July 12th, 2013. From acclaimed filmmaker Guillermo del Toro comes Warner Bros. Pictures’ and Legendary Pictures’ sci-fi action adventure “Pacific Rim.” When legions of monstrous creatures, known as Kaiju, started rising from the sea, a war began that would take millions of lives and consume humanity’s resources for years on end. To combat the giant Kaiju, a special type of weapon was devised: massive robots, called Jaegers, which are controlled simultaneously by two pilots whose minds are locked in a neural bridge. But even the Jaegers are proving nearly defenseless in the face of the relentless Kaiju. On the verge of defeat, the forces defending mankind have no choice but to turn to two unlikely heroes—a washed up former pilot and an untested trainee who are teamed to drive a legendary but seemingly obsolete Jaeger from the past. Together, they stand as mankind’s last hope against the mounting apocalypse.